For the current Washington Nationals, see Washington Nationals. For the American Association Washington Senators, see Washington Senators (1891–99). The Washington Senators baseball team was one of the American League's eight charter franchises. Now known as the Minnesota Twins, the club was founded in Washington, D.C. in 1901 as the Washington Senators. 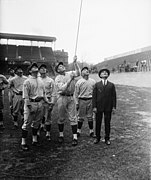 In 1905, the team changed its official name to the Washington Nationals. The name "Nationals" appeared on the uniforms for only two seasons, and was then replaced with the "W" logo for the next 52 years. However, the names "Senators", "Nationals" and shorter "Nats" were used interchangeably by fans and media for the next sixty years; in 2005, the latter two names were revived for the current National League franchise that had previously played in Montreal. For a time, from 1911 to 1933, the Senators were one of the more successful franchises in Major League Baseball. The team's rosters included Baseball Hall of Fame members Goose Goslin, Sam Rice, Joe Cronin, Bucky Harris, Heinie Manush and one of the greatest players and pitchers of all time, Walter Johnson. But the Senators are remembered more for their many years of mediocrity and futility, including six last-place finishes in the 1940s and 1950s. Joe Judge, Cecil Travis, Buddy Myer, Roy Sievers and Eddie Yost were other notable Senators players whose careers were spent in obscurity due to the team's lack of success. Clark Griffith died in 1955, and his nephew and adopted son Calvin took over the team presidency. He sold Griffith Stadium to the city of Washington and leased it back, leading to speculation that the team was planning to move, as the Braves, Browns and Athletics had done in the early 1950s, and the Giants and Dodgers would do later in the decade. After an early flirtation with San Francisco (with a "Triple A" Pacific Coast League team, the San Francisco Seals), by 1957 Griffith was courting Minneapolis–St. Paul in the Upper Midwest of Minnesota, a prolonged process that resulted in his rejecting the Twin Cities' first offer before agreeing to relocate. The American League opposed the move at first, but in 1960, in the face of the Continental League's proposed Minnesota franchise, a deal was reached. The Senators moved and were replaced with an expansion Senators team for 1961. The old Washington Senators became the new Minnesota Twins. The longtime competitive struggles of the team were fictionalized in the book The Year the Yankees Lost the Pennant, which became the legendary Broadway musical and movie Damn Yankees (starring then "heart-throb" leading-man actor Tab Hunter). The plot centers around Joe Boyd, a middle-aged real estate salesman and long-suffering fan of the Washington Senators baseball club. In this musical comedy-drama of the Faust legend, Boyd sells his soul to the Devil and becomes slugger Joe Hardy, the "long ball hitter the Senators need that he'd sell his soul for" (as spoken by him in a throwaway line near the beginning of the drama). His hitting prowess enables the Senators to win the American League pennant over the then-dominant Yankees. One of the songs from the musical, "You Gotta Have Heart", is frequently played at baseball games. The (expansion) Washington Senators were mentioned several times in Tom Clancy's book Without Remorse. ^ "Minnesota Twins Team History & Encyclopedia". Baseball-Reference.com. Retrieved 2008-09-24. ^ Grosshandler, Stan (February 1981). 13 Most Forgotten Stars In Major League History. Baseball Digest. Books.Google.com. Retrieved 3 May 2012. ^ Vass, George (August 1999). 20th Century All-Overlooked Stars. Baseball Digest. Books.Google.com. Retrieved 3 May 2012. ^ Dryden, Charles (June 27, 1904). "untitled". Washington Post. ^ Kelly, John (6 October 2012). "Picking the National's team name all by design". The Washington Post. ^ "Tigers Climb Into Second Place - Defeat Nats Twice, A's Upset Tribe". St. Petersburg Times. Associated Press. 1940-06-16. p. 19. Retrieved September 6, 2012. ^ "Washington Senators (Nationals) (1901-1960)". www.sportsecyclopedia.com. ^ "1911 Washington Senators". Baseball-Reference.com. Retrieved 30 April 2012. ^ "1912 Washington Senators". Baseball-Reference.com. Retrieved 30 April 2012. ^ "1913 American League Team Statistics and Standings". Baseball-Reference.com. Retrieved 30 April 2012. ^ "1924 World Series". Baseball-Reference.com. Retrieved 29 April 2012. ^ a b "1924 World Series Game 7 box score". Baseball-Reference.com. Retrieved 29 April 2012. ^ a b c Ruel, Muddy (October 1964). How Senators' Strategy Won for Johnson. Baseball Digest. Retrieved 29 April 2012. ^ "Senators Reject Bids to Move to Minneapolis or St. Paul". New York Times. Associated Press. October 27, 1957. Retrieved 2008-05-02.